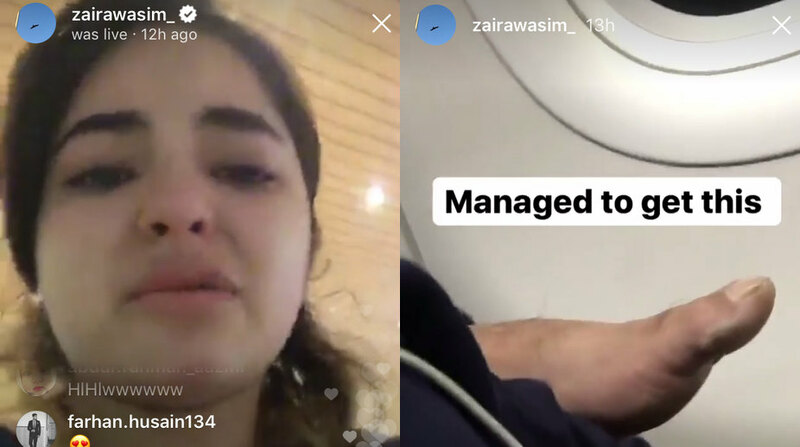 The National Commission for Women (NCW) has written to the Maharashtra DGP and the ethics officer of Vistara Airlines over allegation that Dangal actress Zaira Wasim was molested on board a flight from Delhi to Mumbai. In an email to them, the NCW said it had taken cognizance of media reports regarding the incident and it expected action in the matter. “It has been reported that the actress said the man was rubbing his foot against her back and neck while she was half asleep in the plane. “She posted a video on the social media platform a little after midnight in which she narrated the harrowing incident on board the Air Vistara flight, tears rolling down her cheeks,” NCW chairperson Rekha Sharma wrote. Although the airline claimed they had zero tolerance for such behavior, no complaint was filed with police, the NCW chief said. Sharma asked the Maharashtra DGP and the Vistara officer to give a satisfactory explanation to the commission on the matter within 24 hours, “failing which the Commission will be compelled to take action under powers in the NCW Act, 1990”. Wasim on Saturday alleged she was molested by a co-passenger on board a Delhi-Mumbai flight. The “Dangal” actress narrated her ordeal on Instagram via live video. Wasim said she was on an Air Vistara flight from Delhi to Mumbai when a co-passenger sitting behind her put up his feet on her armrest.